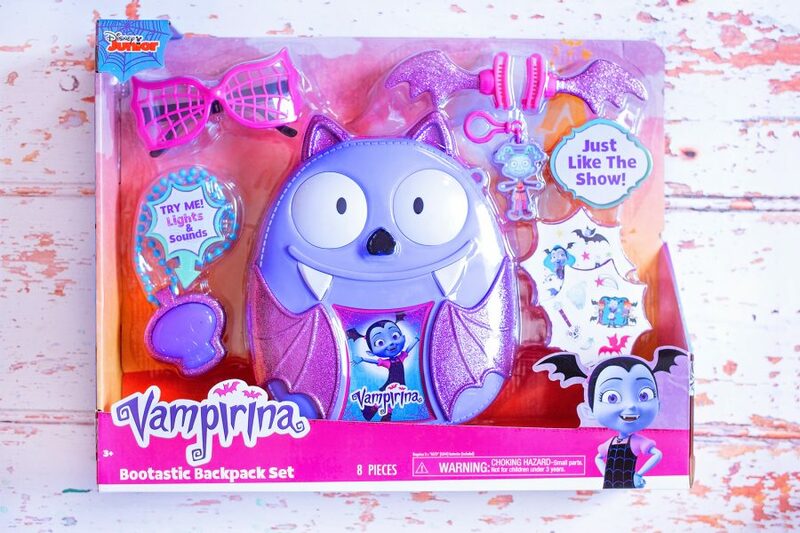 JOIN THE DISNEY JUNIOR VAMPIRINA TOYS TWITTER PARTY! JOIN THE VAMPIRINA TOYS TWITTER PARTY! It’s so nearly time! 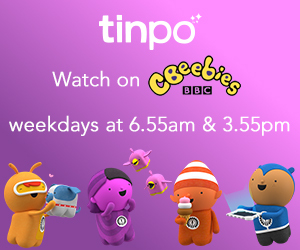 Only ten days to go until the big Vampirina Twitter party with UKMums.Tv on October 25th, 1-3pm! 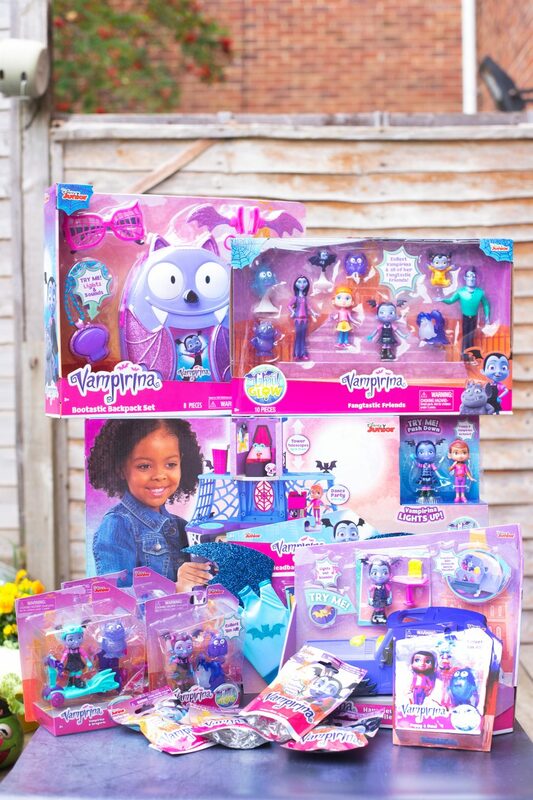 We were sent SO many Vampirina toys to try out ready for the party day, so make sure you join in for chances to win! Vampirina is a huge character in our house. If you haven’t heard of her, she’s Disney Junior’s little Vampire whose family has moved to a suburban neighbourhood from Transylvania and they’re trying to fit in with the human race. The boys love her and the reason I know that, is because I know the theme tune very, very well. So we were COMPLETELY delighted to be invited to join in with the Vampirina Twitter party on 25th October from 1-3 – and if you have Vampirina fans in your house, this is a fantastic way to try and help Father Christmas out a little bit! This is the huge hit of the spooky season, which I had a play with on my Shop Disney launch outing last month! 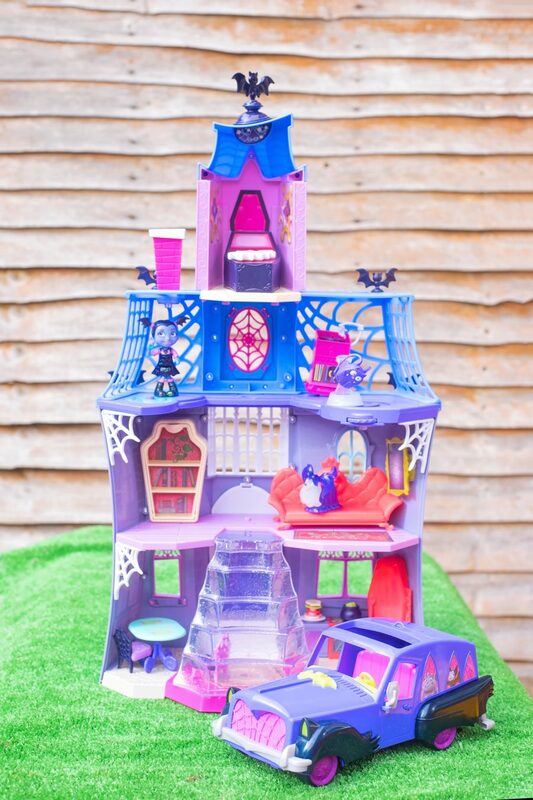 It’s the Vampirina Scare B&B Playset where Vee lives in the series with her parents. This has been on Hero’s Christmas list since he saw it on TV. 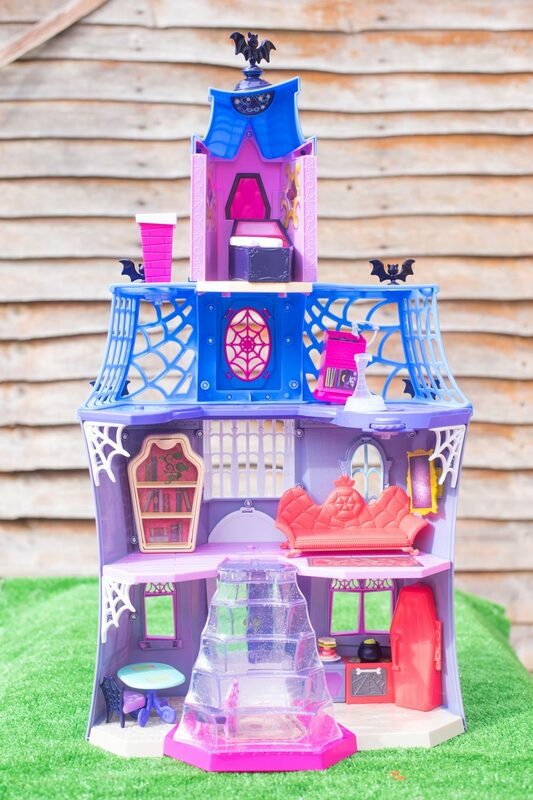 Just like in the TV series, the Vampirina Scare B&B Playset is three floors of spooktacular fun for little ones! The set requires some assembly and some sticker-placing too, and it took me about 20 minutes to get everything into the right places. 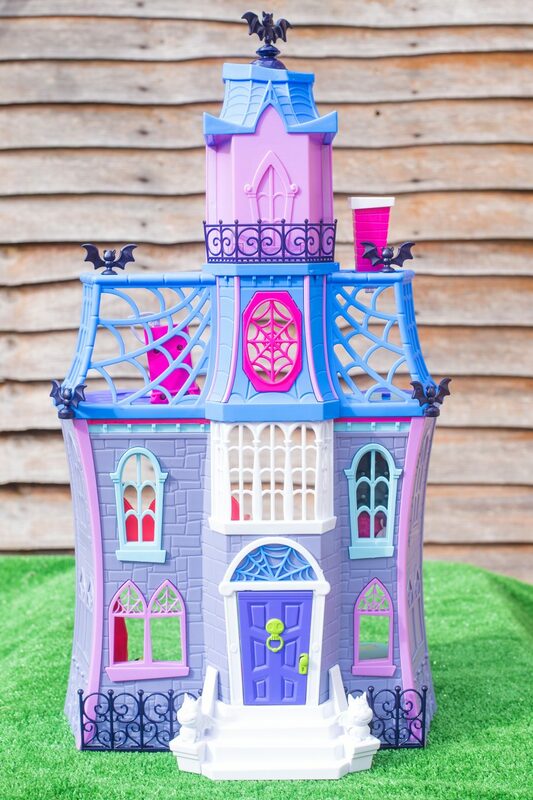 There are so many sweet touches to the playset – a secret reveal telescoping bedroom tower with magically growing portraits [like in the Haunted Mansion at WDW] a bed which transforms back into a bookcase, magically rising food in the kitchen, and a very funky record player that moves and shakes when Vampirina dances near it. There’s even a 360° spinning TV in the living room to add to the ghoultastic set. What’s brilliant about the B&B is that there are 6 special spots throughout the house where Vampirina can be popped to glow! Hero’s favourite is when she hangs upside down! The only reservation I have about the set is that the little bats might not stay on the set too long as they were just popped into little holes around the house. I think they might take flight. haha. 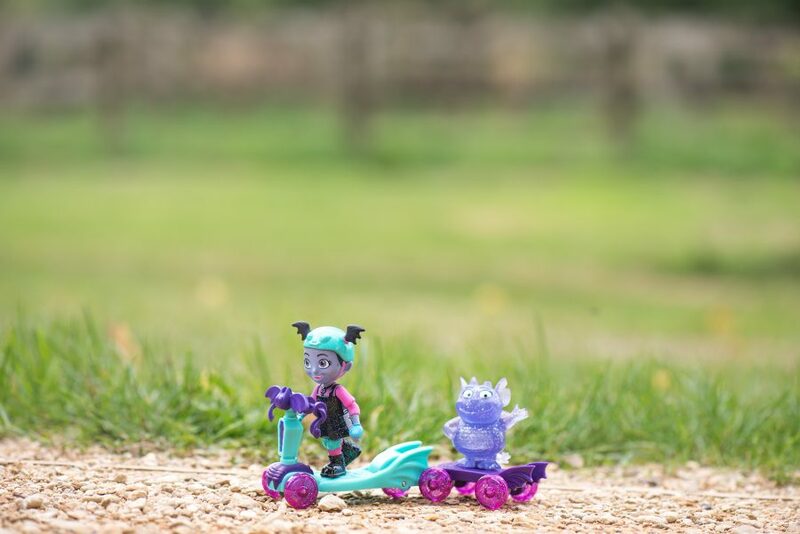 There are the cutest little scooter sets which the boys adored – there are assorted characters including Poppy, but we love the Vampirina one best with Gregoria the Gargoyle joining her on a skateboard as she scoots along! Each set contains a 3.5 inch figure, a little friend figure and scooter, and a skateboard too, for towing! 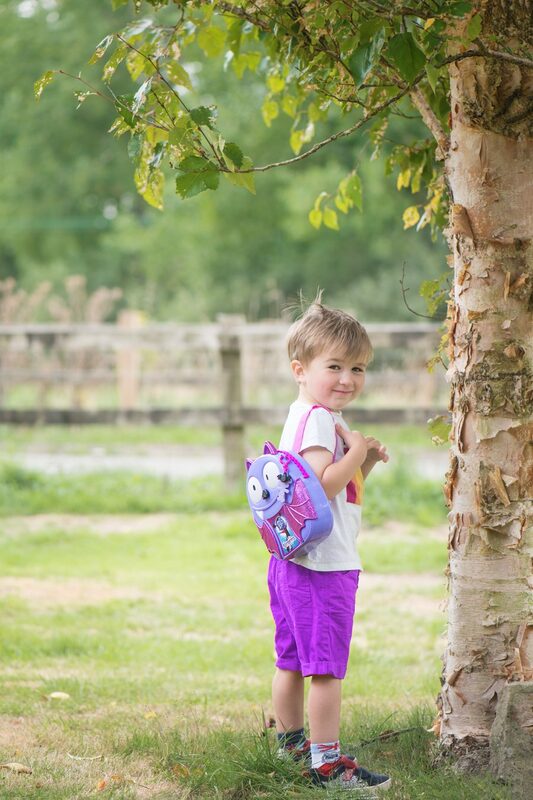 Hero has been wearing this to Pre School, calling it his Hallowe’en bag. 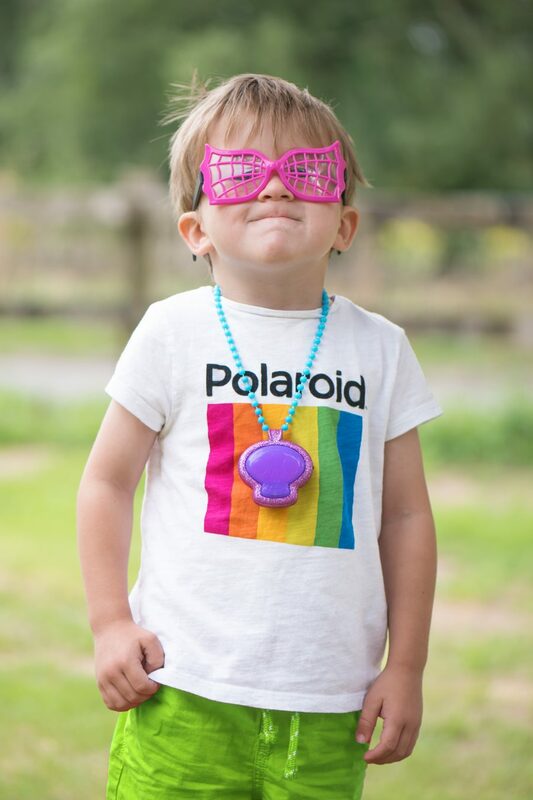 It’s a hard, plastic case with a light & sound necklace, pink funky web-tastic sunglasses [which are worn constantly], and glittered bat wing hair clips which sadly aren’t staying very well in Hero’s hair so he’s put them on a bear instead! The set also comes with an adorable Creepy Caroline backpack clip and 2 sticker sheets to have fun with. The little necklace beads did snap but we were able to fix them very easily by clicking the beads across each other and Hero was happy again. 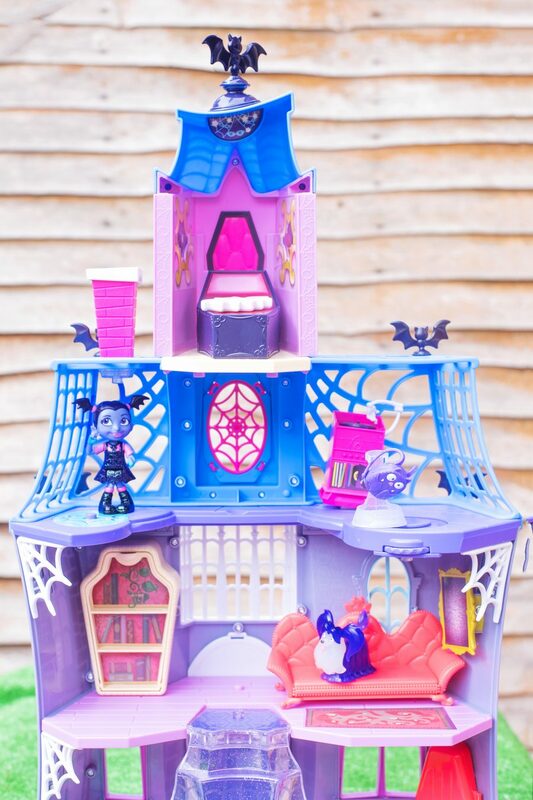 Again, there are various characters to play with – the Best Ghoul Friends sets feature Vampirina and Poppy and their monster pals as adorable figures with added Ghoul Glow magic where the figures can be placed onto the Ghoul Glow Lights & Sounds Chamber to hear sounds and watch their figure glow from the inside out. We don’t have the chamber but Hero has put it on his Father Christmas list very swiftly. Vampirina blind bags! 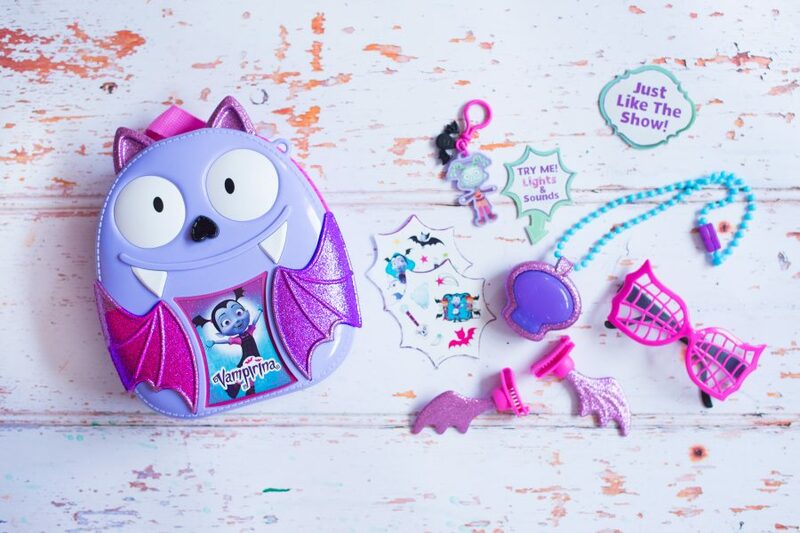 There’s nothing my boys love more than blind bags – the Vampirina set has 12 characters to collect and create your own Vampirina world! Come and see who we got at the twitter party! This is the ultimate set – everyone’s in! The Fangtastic Friends set comes with 10 characters from the show which means that the B&B is going to be a full house! Each of the characters has a ghoulishly fun glitter accent or poseable arms, an are ready to bring the world of Disney Junior’s Vampirina to life! 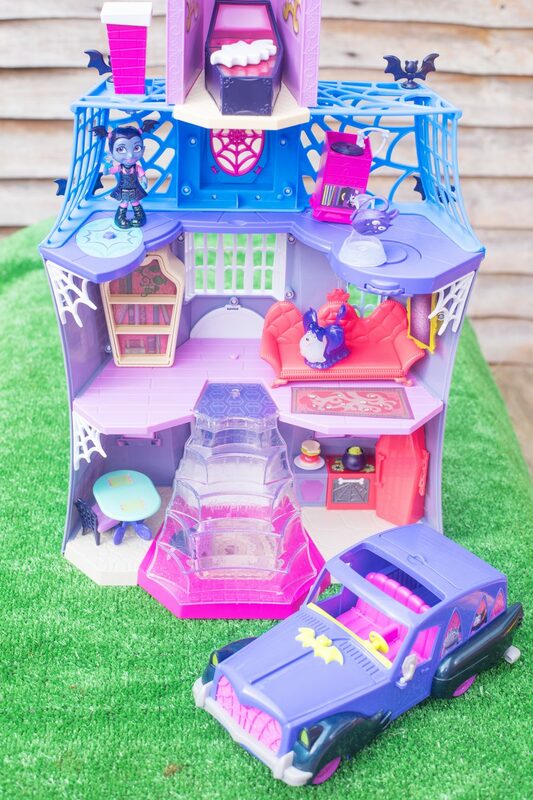 This might just be the car of my dreams, and the boys are so impressed – the Vampirina Hauntley’s Mobile Vehicle is a bright purple, bat-detailed ride which transforms into a spook-tacular drive-in cinema by opening up the back to reveal a bat-tastic table, bench and movie screen! And that’s everything – not everything is featured here in the photographs because we’ve kept some back for the Twitter party! Don’t be late! 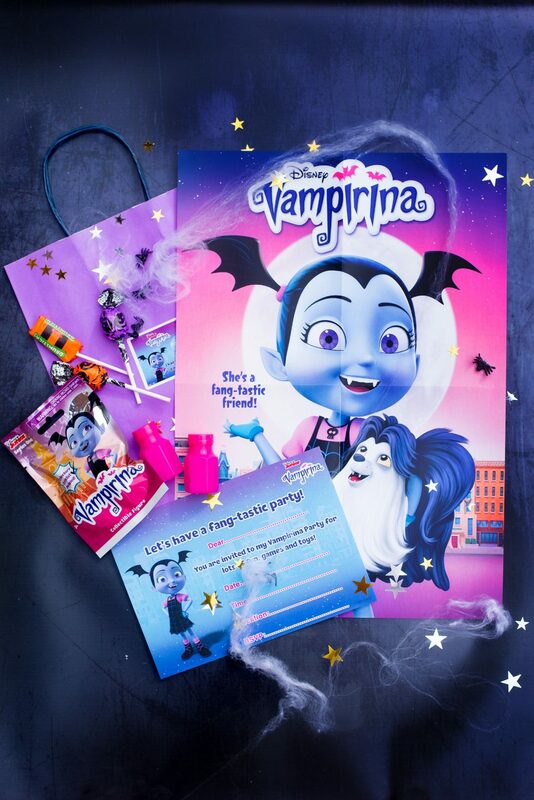 We received these Vampirina Products for the purposes of the Twitter Party. All opinions are our own. 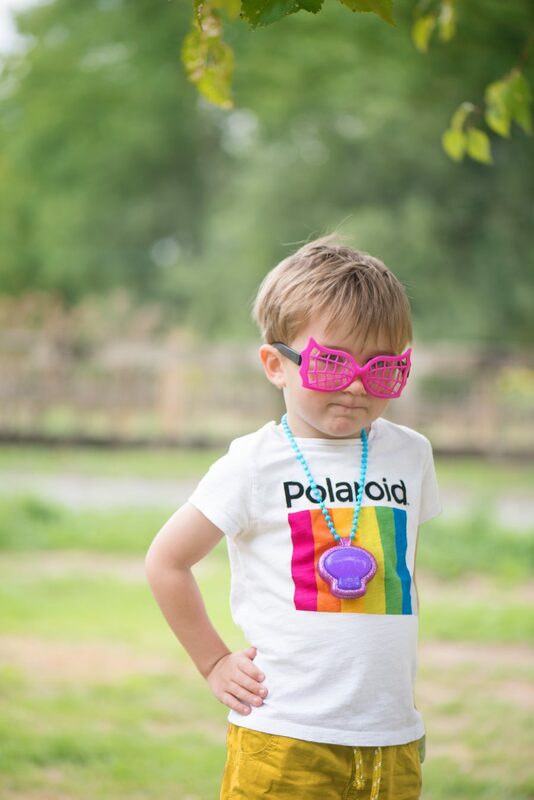 « PJ MASKS SUPER MOON ADVENTURE PARTY DAY IS COMING!